All the content in this blog post, including images is CC0 public domain. You are free to distribute, modify, sell, rent or whatever else you feel like doing. Author claims no responsibility for anything ever. Congratulations. You decided to make a long larp campaign that offers rewards for those who try hard. Rewards make your players more powerful and everyone will try hard to be a good little larper so they could be rewarded. Rewards usually include wealth, social status, military rank, Levels(tm) or powerful items. Best larpers go up, okay larpers stay down. In theory, it becomes a wonderful pyramid of power where a select few godlike heroes assisted by a lot of weaker allies maw through hordes of enemies. If it’s a political larp, your select few give orders to their lovely minions and wisely wait for them to solve the problem or help out if the problem proves to be too hard for the average larper. Unfortunately, real world never works just like that. Usually, a lot of friends play all the time and get a lot closer with the organizers and each other. Sooner or later, they start socializing outside the larp and their off-game ideas start bleeding into the game. Subsequently, they spend more time to prepare their own awesome moments then to promote the larp to a target audience. People that didn’t get into the magical social circle often disperse or just play less often or they play with half an interest. The result? An upside-down pyramid where a lot of powerful players overshadow a few less powerful players while the occasional newbie just feels dumb for even trying to play this. Of course, your power level is not important as long as you are having fun, right? Right. Unfortunately, the circle at the top of the pyramid has insatiable power hunger and they usually eat all the fun in the process. If the power is measured in social status, you get a lot of powerful figures solving all the powerful problems and complaining about the lack of respect from their minions while the powerless few minions below just make their own fun, often something that has nothing to do with the larp. If Levels(tm) are involved, it gets even worse because it’s impossible (and counter-productive) to make situations in which a few low power characters can be as useful as a whole bunch of high power characters. So, how do you solve this mess? It’s not easy turning a jerk circle of your dearest friends into a more sensible pyramid, but if the organizer cannot do it, who can? Secondary option is making something fun for the low levels in a way that the high levels wouldn’t want to do it, wouldn’t have time to do it or wouldn’t know about it at all. Feel free to discuss these problems and solutions in the comment section or wherever you see fit. Feel especially free to discuss these problems with players that play at the bottom of the pyramid. I think this is pretty spot-on for how some larps can develop. Quite sad when it does, particularly as it can prevent new talents from entering into our fantastic hobby. We see this occur less on the Nordic larp scene, for a variety of reasons. Mostly because there are fewer long campaigns, less focus on quest-type games and most games don’t have levels but rather what-you-see-is-what-you-get. 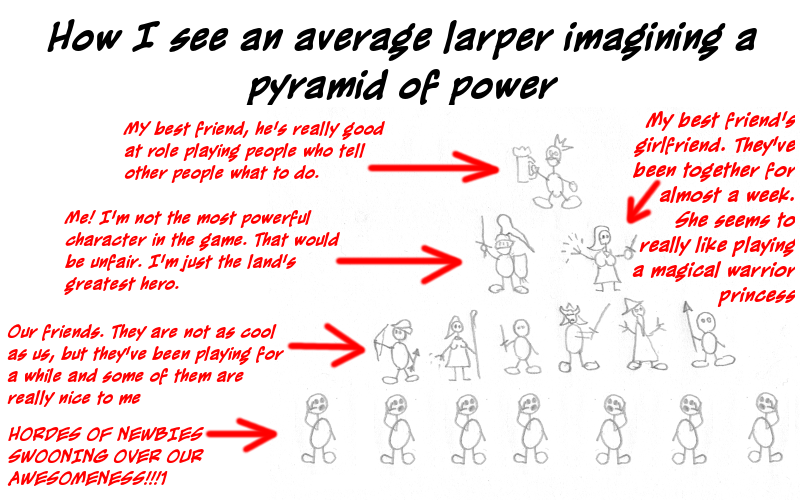 We also work a lot with “play to lose”, meaning that in-game hierarchies are less determining for the quality of game play – the guy/gal at the bottom may be the most experienced, having the most awesome larping. – Shake things up. Change the focus or politics of the game, introduce new elements, maybe throw in completely new, powerful groups which do not include many old players. – Talk to players. Some leading player might want to “step down” and take less of a lead role, someone you thought wanted to be a hero might be quite content in the low-key role he has and someone you always thought of as serving girl might have hidden dreams of becoming a soldier. You won’t know unless you ask. – Write a larp that is less focused on the highest hierarchies. Why not one where the plots are centered around the farmers and shoemakers, while the noblemen and -women are bystanders? It’s completely doable (done it myself) and may well turn out much better than former larps. – If none of the above works, why not take a pause and go larp somewhere else yourself, or start a completely new campaign? Here’s a wild idea: Why does there need to be a Pyramid? Why can’t it just be an even playing field? If a larp has progression, it expects a pyramid. Unfortunately, pyramid soon turns upside down and slowly turns into a circle before dying completely. 2. The disparity of power between someone at the top and the bottom needs to not be grossly large. In the case of combat, a low level PC should be able to stand side by side the high level PC and feel like the application of their skill, wit, and even game stats contribute significantly. The downfall of the inverted pyramid isn’t that it exists, but specifically how it interacts with the game. Thus a LARP’s design, if it’s implementing systems that will cause it to exist, must account for and explicitly try to mitigate the potential harm before it even happens. Ugh, I meant NOT suffer too harshly. That’s what I get for not reading the comment through before posting. There’s a list of about 20 options for improvement. When you get 5 XP, you pick one option. Five of those options can’t be unlocked until you’ve gotten 5 of the basic options. Each time you pick an improvement, you cross it off. So the list of options narrows over time. Two of your advanced options are “start a new character” and “retire a character to safety”. Therefore every character has a limited life span. The quicker you accumulate game bennies, the quicker you have no option left except retirement. Now this means, more or less, that once your initial players “graduate off the top”, you’re essentially playing a new campaign in the same setting but I think that can be a good thing. It creates a more epic, multi-generational feel. I’d love to see something like that tried in a LARP system. Why not a level playing field? Because some people have more experience than others. Some people are more athletic than others. Some people have more time / energy to spend studying the rule book and optimizing their character build. Some people will have more money for better equipment. Thus you’ll have a group at the top that can out-anything new folks. One solution I use, since I have lots of equipment, is to loan stuff out to new people. I will hit the park with 4-5 shields, obviously I’m not using them all! In order for everybody to be on an even playing field a few things would need to be true. No one could ever get any experience rewards. There would have to be little to no conflict in the game, and everybody would have to be equally as good at playing their characters. Any of those things being different causes stratification. People tend to make groups in larger larps, sometimes based on stat based power, sometimes based on social power, sometimes based on ooc or ic conflicts. Grouping is always going to cause stratification. Especially with people who aren’t as good at being in character as other ones, or who have more time to devote to LARP. In terms of combat ability. In the game I have done the most work on we worked hard to flatten the amount of difference in power level between a well established character and new character. 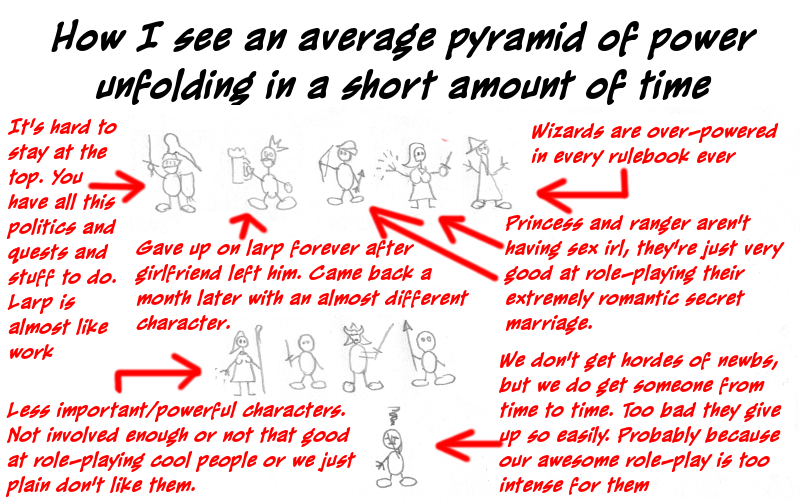 The game is more player vs player than many other larps so it was easy to establish a baseline. We wanted 3-5 new characters (no experience) to be able with some planning to kill the most established of characters (2-3 years of play). This creates an environment fear of death is a real thing for all characters. This sort of thing is much harder when the game is more player vs storyteller, at least from a combat perspective, but you can still try to flatten it out. If an established character can be counted on to kill 3-5 “normal” monsters and a new players can kill 1 maybe 2, then the established character is certainly better but he doesn’t eliminate the need for the new player. The important part here is that the new players are able to participate and that it is not a bad choice to have them participate in an overall resource battle that is the entire event. It is more difficult to flatten this out because established characters will have more information about what has been happening and the storytellers at the game will have a better understanding of the established characters and hooks they can use to interact with that character. The most successful experiment I have seen for this is having seen to work with this is to have new players come in with a group concept. 5-10 new players working together for a common cause can’t be ignored. the inverted pyramid also stands more prominent in a system like white wolf where political power is built into the game. Especially when you are talking about a long term RP. you have (at least locally) all these people who are friends OOC who gravitate to positions of power IC because they vote for each other to get into those kinds of positions. and of course since most of these people have known the STs for years and the ST doesn’t want to hurt his friends feelings turns a blind eye to it, while making it frustrating for people who are new to the game to ever find their way into the upper echelon of political power, and the longer the game goes on the bigger the gulf between veteran and rookie gets. The second paragraph sounds like a matter of perspective. I mean sure, if I miss a session, I’m behind the power curve of people who did and I didn’t get the experience (the actual player experience, not XP) of going. However, given all of the things I can be doing in my life, if I picked something else its because I would rather have been doing that than participating in the game. If you have something going on that’s cooler to you than earning XP and the experience of playing the game, that’s not an issue. That’s life functioning as intended. If a game requires you to participate in every session in order to remain engaged, that’s a major design flaw. I’m a pretty big fan of Dystopia Rising’s play style. Meet once a month. Talk out of character all you want. Lay hypothetical plans and strategies. In Character actions can only happen within the confines of the session. Other people might (do) far outpace me in experience but I always have a list of things I want to do when I do show up. The game I played came up with an interesting idea for dealing with this to some extent. First of all, the game was very difficult strategy wise, and it was important to always make sure everyone in a given fight was at least somewhat protected, or they’d inevitably get captured and dominated and turned against you or something. So even if you were an experienced player, you couldn’t get away with never working together with everyone else in the game, and if you tried to hoard resources you’d be left standing alone with no one to protect you. A novice was someone with less than a certain amount of build, so either a new player or just someone who didn’t show up very often. Certain calls could target everyone who wasn’t a novice, certain monsters could only be effected by novices, and so forth. The plot team also would plan town fights so that there would often be three or even four things going on a once, and at least some of them would scale in difficulty. So the very high levels players would have to deal with one thing, the newer players could fight what they could handle, and there would always be That One Monster running around the sidelines looking for That One Player who was better at IRL fighting than everyone else in the game to keep him occupied. There are also ways of influencing the social culture of the larp between games. For instance, if you provide players with a forum or some other place to talk online, where your plot staff also hang out and talk to people, you can get a good feeling of how big of jerks that some of the players may or may not be acting like towards eachother. Just one “Hey guys don’t bash the newbies so much” from a plot team member can make a lot of difference in player culture.